My name is Emely. I am 10. I had to make some Easter cupcakes for a school fete so I decided to make Easter Bunny Cupcakes. They were so much fun to make and Mom has said I can make them again for the family on Easter Sunday. Mom made the cupcakes but I helped her. She let me do all the decorating by myself. I covered the tops of the cupcakes with white frosting and then dipped them in dessicated coconut. Next I cut two pieces of stick gum into a shape that looked like a bunny ear. Mom helped to pipe the frosting around the edge of the ears and then I sprinkled them with coconut so the edges of the ears would like like they were fluffy. I cut two little slits in the cupcakes where I wanted to put the ears so that they would stand up by themselves. Next I got one pink and two white mini cupcakes and they became the nose and cheeks. Mom cut the licorice into thin strips so it could be the whiskers. She also cut out two circles of licorice for the eyes. Everyone at school loved them and I sold all my Easter bunny cupcakes. 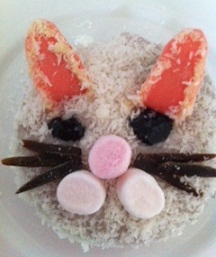 Thanks so much for sending in your picture and instructions on how to make Easter Bunny Cupcakes. They look fantastic. I am not surprised that you sold them all at your school fete. Everyone loves to buy home-made cakes, especially when they have been so beautifully decorated.